With the new year soon upon us, I wish you much happiness and joy. Dealing with the other parent is not always easy. Stay focused on your children and work hard at these resolutions. It will help you and best of all, it will help the kids! 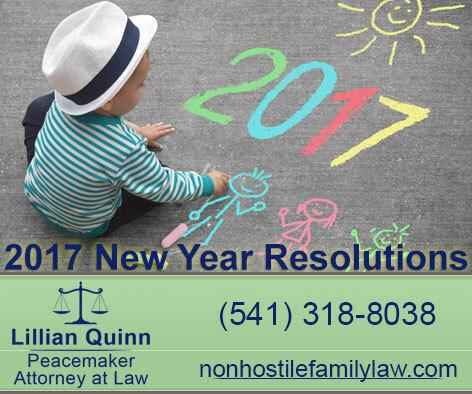 I will promise to keep my child’s best interests in mind while going through this divorce or healing from this past divorce. I understand that even though I am traumatized, my child is traumatized, too. My child needs me to be mentally and physically healthy. My child is not my counselor. I will promote my child’s relationship with the other parent. I will speak only positive statements regarding my ex-spouse. I will look at the good things that they are capable of doing. Maybe they were a terrible spouse but they are a terrific parent. I will overlook the fact that my ex spouse did not send our child back to school with the correct homework. Next time, I will write down the homework assignments and use only positive words with my ex-spouse. We are on the same team when it is regarding our child. I will compliment my ex spouse on something that our child really enjoyed doing while being with them. I will remind myself how important it is for our child to have both parents in their life. I will smile and be civil when I am introduced to my ex-spouse’s new love. I will encourage that person to love and be good to our child. It can be one more person on the team supporting our child. I will remind my ex-spouse of an important school event coming up in our child’s life and ask that they attend while explaining how our child lights up when they are at school. I will remind myself that there are a lot of single parents who do not have the opportunity to have an ex-spouse involved. I will know that I am lucky that my child has two parents that love and cherish them. I will not compete with my ex-spouse on gift giving, on activities or in any other unhealthy manner. I will share some of my parenting struggles with my ex-spouse so they can have an open dialogue with me regarding what works and what doesn’t work with our child. All parents struggle and it is okay not to be the “perfect” parent. I will understand that people have different ways of parenting and that my spouse will not parent our child the same way I will. The child wins having both styles and both people in their life. I will work on being a happier, positive person. Time will be set aside to focus on my needs so that I can be emotionally, physically, spiritually and mentally together for my child. I will pamper myself. If I go down, the ship goes down!